Rising above Kolob Arch by a mere three feet, the beautiful Landscape Arch is the largest arch on the planet, having a span of 290 feet. Landscape Arch is located in Arches National Park just north of Moab, Utah. It has been weathered over many centuries, giving it its unique, yet beautiful, look. As part of the natural erosion process, chunks have broken off and lay crumbled at the arch’s bottom. Because of this, the arch is held in place by only a delicate, thin center. Whether or not Landscape Arch is there to stay is a question yet to be answered. It is unclear whether the arch will crumble to complete rubble or if it will continue to stand for hundreds of more years, having just shed some pounds. The hike to Landscape Arch is definitely worth your while. It is approximately 1.5 miles round trip and is rated easy to hike. This hike is perfect for families of all ages as the trail is paved, wide, and level. The Arch lies at the end of the Devil’s Garden Trail. The Devil’s Garden area is host to many beautiful arches and is located at the top of Arches National Park. It’s trailhead, ending at Landscape Arch, is a beautifully paved and wide open trail. 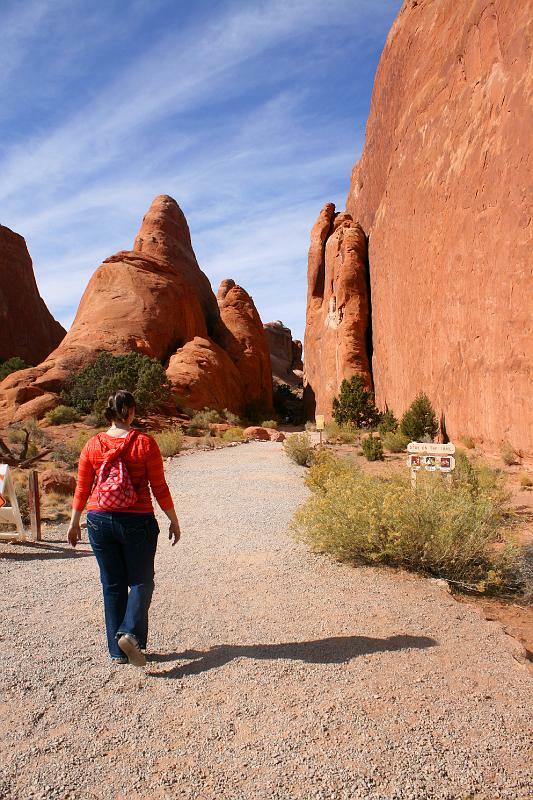 Not many trails in the Arches region are as easy to hike as the Devil’s Garden Trailhead. While on the trailhead, visitors can break off on another trail that extends to the Primitive Loop which provides access to many other amazing natural structures and sites in the area. Not long ago there was a short trail that passed directly underneath Landscape Arch. This was an incredibly stunning way to get up close and personal with the beautiful structure. However, due to the natural erosion process causing chunks to fall from the arch, visitors are no longer allowed to use the trail. 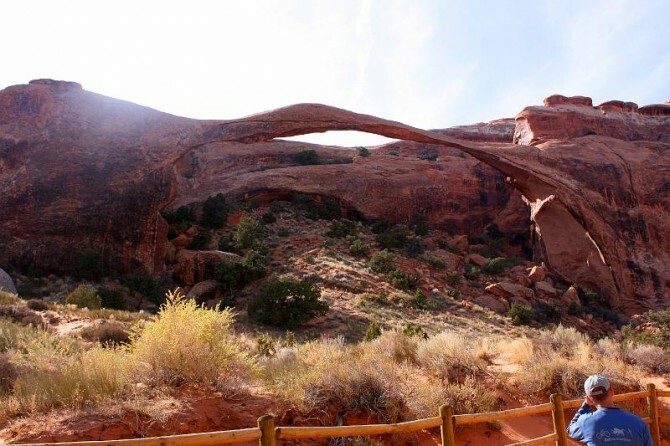 However, this fragile, delicate-looking arch can be just as astounding when viewed from the main trailhead and viewing area. While Landscape Arch is a definite reason to visit Arches National Park, there are many other lesser, yet beautiful, arches to be explored on your venture up to Landscape Arch. 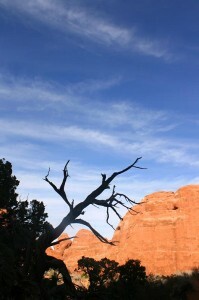 The Spur Trail is a little trail that takes you to two lesser known arches. This trail is located a few hundred feet off of the Devil’s Garden Trail and brings you to Pine Tree Arch and Tunnel Arch, depending on the fork you take. Many other arches you can visit on your hike up to Landscape Arch include Private Arch, Partition Arch, Navajo Arch, Wall Arch, Double O Arch, the Dark Angel Pinnacle and more. The Primitive Loop takes you to all of these spectacular arches. Landscape Arch is the largest arch in the entire world and therefore it is rightfully famous. Visitors from all parts of the world travel to Arches National Park to feast their eyes on the beauty of Landscape Arch. It is worth visiting and taking the quick and easy hike to snap a few breathtaking pictures.